Lysine-specific histone demethylase 1B (KDM1B) belongs to the flavin monoamine oxidase family. KDM1B is a histone demethylase that demethylates 'Lys-4' of histone H3, a specific tag for epigenetic transcriptional activation, thereby acting as a corepressor. KDM1B is required for de novo DNA methylation of a subset of imprinted genes during oogenesis. KDM1B demethylates both mono- and di-methylated 'Lys-4' of histone H3, but has no effect on tri-methylated 'Lys-4' or other methylated Lys residues of histone H3 or H4. Rabbit polyclonal antibodies were produced by immunizing animals with a GST-fusion protein containing the N-terminal region of human KDM1B. Antibodies were purified by affinity purification using immunogen. Fig 1. 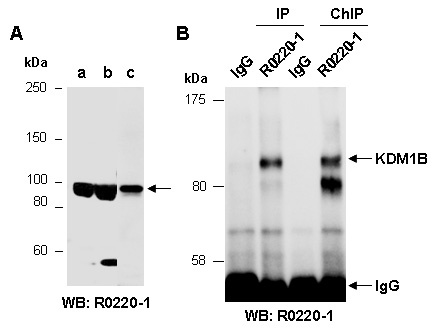 (A) Western blot of total cell extracts from a. mouse thymus, b. human HepG2, c. human HeLa, using anti-KDM1B (N) (R0220-1) at RT for 2 h. (B) Total extracts from mouse thymus were immunoprecipitated (IP) with IgG or anti-KDM1B (N) (R0220-1) under the conventional IP conditions or cross-linked chromatin immunoprecipitation (ChIP) conditions; followed by WB with anti-KDM1B (N) (R0220-1) at RT for 2 h.